Fine pair of green jasper vases. 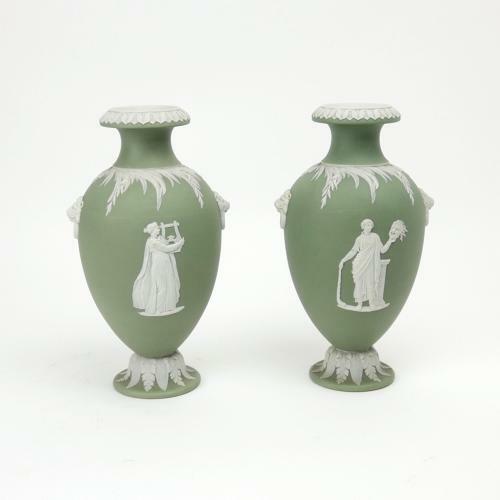 An attractive pair of Wedgwood, green jasper dip vases. Each vase has an impressed 'WEDGWOOD' mark and they date from c.1860. There are also a couple of very small, impressed, workman's marks but these are quite indistinct. Each vase has a large relief, depicting one of the Muses, to either side. These reliefs are all different. The reliefs on the shoulders of the vases are grasses, and these are quite unusual. Both vases have white jasper, lion mask handles to the sides and further, foliate borders to the rims and the feet. The vases are made in two sections, with the socles being bolted on. Both vases are in excellent condition.